This super stir fry works by combining taste and texture. The sweetness of the meat and onion, the hot, fresh ginger and chilli, the salty soy sauce. It all adds up with the green peppers and soft noodles to create a delectable dish. The added bonus is it takes just minutes to cook. 1 rib eye steak, at room temperature. 2 cloves garlic, thinly sliced. A handful of fresh root ginger, chopped into matchsticks. Sunflower oil or light olive oil / rapeseed oil for frying. 1 inch of red chilli, chopped (optional). Good frying pan with heavy bottom. 1) Bring some salted water to the boil in a saucepan. Slice your steak into thin strips following the grain of the meat. 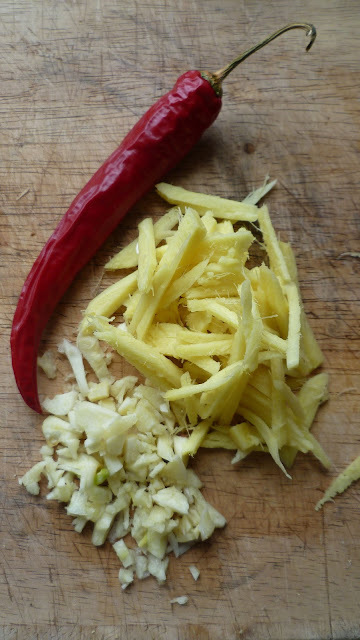 Chop up your garlic, onion, ginger and chilli if using. Slice your pepper to mimic the steak piece sizes (looks pretty when the dish is done). 2) Put your noodles into the pan of boiling water. They are best al dente so only leave them for a minute or so on the heat. Add the oil to a heavy bottomed frying pan and heat up. Check the oil is hot by adding some of the garlic – it should sizzle straight away. 3) Fry the steak, garlic and chilli so it starts to crisp on the outside. Add the onion and ginger and fry for a minute or so more. Then add the green peppers and warm them through. You want them almost raw so they are crispy. 4) Once all sizzling hot take off the heat and add your soy sauce. Add a couple of spoonfuls of the noodle water to your frying pan before draining and serving immediately. You can also serve this with rice. More on that soon.